They were the legendary knights of the west, protecting the innocent and hunting down those villains and bringing the strong hand of justice down upon them. They were the fastest with the guns and very few were able to wear the great badge of honor that set themselves aside from the rest of the average lawmen, fighting to tame the great Western expanse. They were the Texas Rangers! Are you ready to take up the mantel of the immortal fighters of justice? 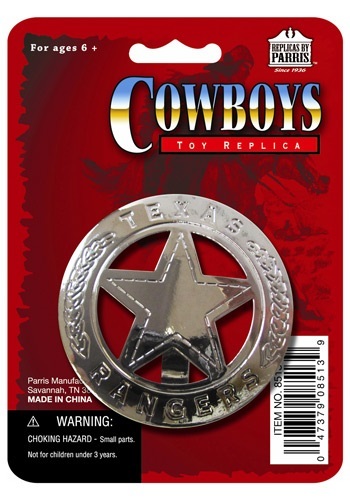 Just a single flash of this Texas Ranger Badge will make those no good bandits sweat bullets. Grab a horse, a hat, and your trusty revolver to head into town and show those western gangs just how long the arm of the law can reach. Grab a few of these and some cowboy costumes so you can get a posse together to take on the bigger jobs, like a huge Halloween party. Yeehaw!